We hand pick our summer staff of about 20 young (and young at heart) adults who are chosen for their ability to share a strong character, maturity, creativity and ability to work with children. Staff spend over a week in training before campers arrive learning what you expect of a Holmes camp experience, how to engage campers quickly into camp groups, how to cook over a campfire, as well as receive certifications in American Red Cross First Aid and CPR. Some also learn specialty skills (lifeguarding, ropes course and initiative facilitation and archery instruction). Our dedicated staff come from churches in the United States and around the world to share faith and broad world views as we live faith together at Holmes. Copy your reference response code and click here to complete a reference. Thank you! We are looking for persons with a Christian Faith to share who are interested in working with children for 7-8 weeks during the summer. Pay starts at $250.00 per week, plus meals and housing. 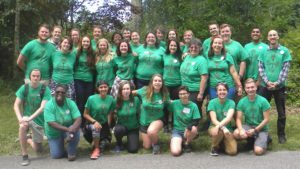 Apply here to be part of the 2019 Holmes Summer Staff! Staff Training begins June 17, 2019, with opportunities to receive optional certifications beginning June 18. Staff will end the summer on August 18, 2019, with time to close up summer facilities and celebrate our summer together. Some positions have longer time commitments, or the opportunity for longer time commitments. If you have any questions about working at Holmes as part of the summer staff, please contact us by email at holmes@holmescamp.org or by phone at (845) 878-6383.